Fiber is a nutrient that helps keep your digestive tract moving. It has been shown to help you feel fuller for longer, so you’re less likely to overeat and gain weight. It may even help manage diabetes and prevent colon cancer when eaten in adequate quantities. Though the most famous fiber-rich foods may be whole grains and veggies, dark chocolate contains this nutrient, too. One serving contains about 5% of your daily fiber needs. The fats in dark chocolate are the healthy kinds of fats. Chocolate often gets a bad rap for being high in fat, but good dark chocolate, like that used in our chocolate covered coffee bean crunch, contains types of fat that are good for the body. Stearic acid, a specific fatty acid found in chocolate, helps keep cholesterol levels favorable. Good cholesterol levels reduce your risk of heart disease and stroke. Dark chocolate is packed with antioxidants. Antioxidants have received a lot of attention lately. They are thought to reduce the risk of cancer, prevent premature aging, and even protect you from the common cold. 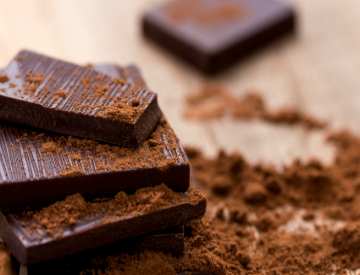 Dark chocolate is a densely packed source of many potent antioxidants, so nibble away with confidence. Visit Hawaii’s Local Buzz to learn about our chocolate covered coffee bean crunch and other delicious chocolate snacks. We use only the best Guittard chocolate in our treats, and we source out other ingredients from our own family farms.